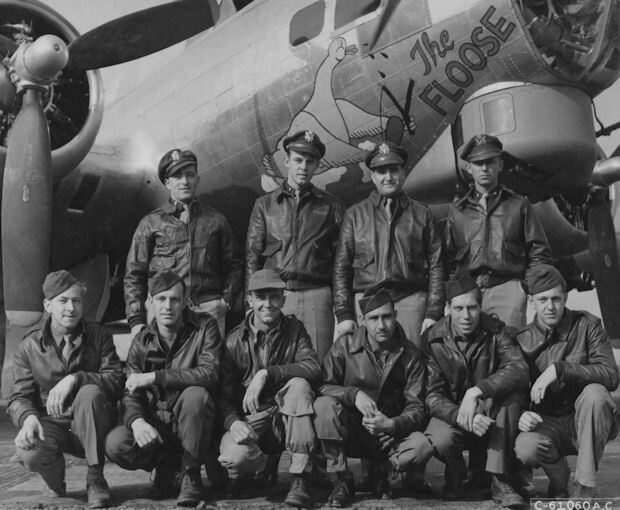 Lt Benham and Crew flew thirty-one credited mission - 303rd mission numbers: 145 (4/30/44), 146, 147, 151, 152, 154 (Spare Return- no credit), 158, 159, 161, 163, 165, 171, 174, 175, 176, 177, 179, 180, 185, 187, 189, 190,193, 197, 200, 203, 209, 215, 217, 222, 223, 227 (13 Aug 1944). All missions completed without an abortion. Last 15 missions (#180 through 227) were lead crew missions. (No lead crew photos are available). 1Lt Philip O. Benham (P) - 1st two missions as CoPilot with orientation pilot Lt. John H. Cook - Became a Lead Crew Pilot on 14 June 1944. Completed combat tour on 13 August 1944 and transferred to 8thAF on 18 August 1944. 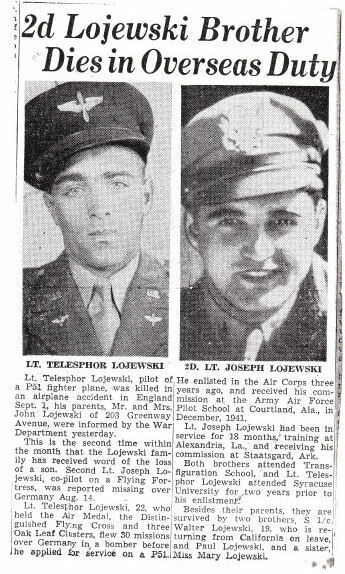 In fact, Joseph Lojewski was a POW and survived the war. 1Lt Telesphor Lojewski (CP)(KIS) - 1st three missions with Lt Frank Maxey. Flew 14 missions as the Benham Crew CoPilot. Upgraded from CoPilot to Pilot on 01 July 1944 and completed his combat tour on mission #202 12 July 1944. Transferred to Eighth Air Force P-51 Scouting Force Service at Steeple Morden. Was flying with 1Lt Charles E. Wright (Previously CoPilot on the 358th BS Lt Harlan J. Johnson Crew) in an AT-6 trainer aircraft flight from Steeple Morden to Molesworth on 01 Sept 1944. The aircraft had an engine failure and, while in a steep bank to line up with an open field, a wing hit the ground, cartwheeled and killing both pilots. 1Lt Willard A. Hamm (N) - Flew on ten missions (#146, 147, 151, 152, 154, 158, 159, 171, 175, 176) with the Lt Benham crew. Completed his last 24 combat missions with ten other Pilots. Last mission #202 on 12 July 1944. 2Lt James A. McCamy (B)(KIA) - Flew seven missions with the Lt Benham Crew. Last three missions with other Pilots. On mission #163, 28 May 1944 to Riotha, Germany, Lt A.G. Determan (P) in B-17G #42-107028 (no name) 358BS (VK-I) received a direct hit by flak on the right wing. During the fall the right wing and tail came off and the B-17 crashed near Leipzig, Germany (7 KIA and 3 POW). T/Sgt Cornelius Van Drunen (E) - Flew three missions (#155, 164, 226) with other Pilots. Combat tour completed on 13 Aug 1944. Transferred to USA on 18 Aug 1944. T/Sgt Reginald Downs (R) - Flew four missions with other Pilots (#194, 195, 224, 230). Transferred to USA on 11 Sept 1944 after completing combat tour on 18 Aug 1944. S/Sgt Lenoir E. Dellinger (TG) - Flew one mission (#216) with another pilot. Flew four missions as a Waist Gunner. Combat tour completed on mission #223 18 Aug 1944. Transferred to USA on 11 Sept 1944. T/Sgt Robert L. Garcia (RWG) - Flew his first ten missions with the Benham Crew. Second waist Gunner position deleted from crew and T/Sgt Garcia completed his combat tour as a Togglier on 19 missions with 8 different pilots. Last mission #271, 10 Nov 1944, and returned to USA. S/Sgt Reginald L. Hill (BT) - Flew his last mission (#230) with another pilot on 18 Aug 1944. All other missions with the Lt. Benham Crew. Transferred to USA on 11 September 1944. S/Sgt Robert E. Bonenberger (WG). Flew one mission (#216) with another Pilot. Other missions with the Lt. Benham Crew. Last mission #227, 8 Sept 1944. Transferred to USA on 11 Sept 1944.